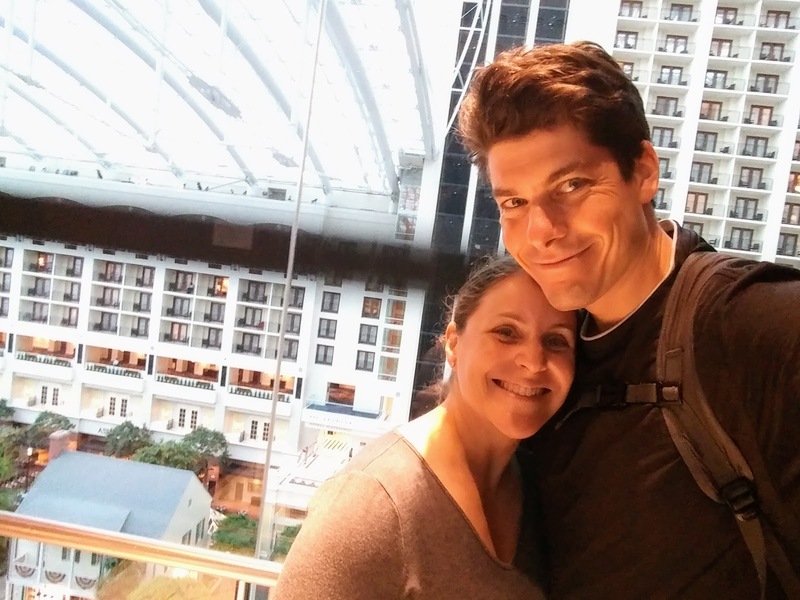 This past weekend Shira surprised me with a mini-getaway to National Harbor to see Journey. It was exactly one month since our 19 year wedding anniversary, and was the perfect way to celebrate another year of wedded bliss. While Journey was playing at MGM, the rooms there were crazy expensive. A relatively short walk away was the Gaylord Hotel, which has views and decor to match, but at a far more reasonable rate. As if to only reinforce her decision to avoid the crazy splurge, a few days before the concert she got an offer to stay at the Gaylord for $84 per night. That's crazy cheap around here. Anyway, it was all meant to be. The original plan was to ride our bikes to the hotel, making for one incredibly luxurious s24o. But, alas, mother nature had other ideas. Last Friday night we had record rain in DC, so we cheated and drove. The concert started with Asia playing for about an hour. I don't really have any connection to Asia, so when the band of mostly aging rock stars took the stage I had my doubts. I was further confused why the lead singer was closely watching an iPad during the performance. Surely he's been singing these songs since I was practically in diapers? Eventually, it all became clear. The lead singer we saw was new to the band, having replaced the one that passed away at the beginning of this year. Ultimately, the guys did great and won me over. Aging or not, these guys can rock! At Asia's first note it hit me: man, I should have brought earplugs, as they were plenty loud and the venue relatively small. While roadies were tearing down Asia's instruments and setting up for Journey, I dashed out of the venue to the front desk of the hotel. I asked if they had an extra set of earplugs. The gal at the front desk couldn't have been nicer, and personally went to house keeping to get us two pairs. Those earplugs made the rest of the concert far more enjoyable. And then it was time to rock out to Journey! They put on a fantastic concert, with all of the well known songs delivered as promised. Their lead singer is a firecracker of a performer, bounding around the stage like, well, a rockstar. The 5 plus minute drum solo by Steve Smith was nothing short of magical. And while Shira found the electric guitar solos painful to listen to (sorry, babe), I enjoyed them. They brought to mind some of the guitar performances I've been listening to on YouTube lately. I would have enjoyed a little more chatter from the band, say giving a bit of background about the songs. But they mostly stuck to playing, letting the music stand on its own. I'd heard rumors that the MGM theater was quite a bit smaller than other local venues, and now I can confirm it. We sat in the very back row of the lowest section and had an excellent view of everything. If a band you're interested is playing there, it's almost certainly worth the extra cost to get in. It's hard to call a 3000 seat theater intimate, but compared to 25,000 seats at Jiffy Lube Live, it absolutely is. Here's a few audio snippets from the concert. Enjoy! Even with the weather not cooperating, it was still an awesome weekend. Happy 19th and one month Babe!